DuPont TV broadcast via station WABD-TV. 2 songs associated to this session were recorded earlier: "He's funny that way" from 27-7-52 and "I cover the waterfront" from 7-8-41. 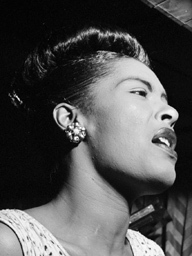 This interview is mis-titled "Night Beat" on the Italian Lady Day Box. 1 (Interview) INT GoJ 1001 GoJ 1001 / LDB.17 / JUTB 3044 3'02"
2 Don't explain INT GoJ 1001 GoJ 1001 / LDB.18 / JUTB 3044 2'15"
3 Fine and mellow INT GoJ 1001 GoJ 1001 / LDB.18 / JUTB 3044 2'24"
4 Yesterdays INT GoJ 1001 GoJ 1001 / LDB.18 / JUTB 3044 10'11"